Lexington County, S.C. (Blowfish) – The Lexington County Blowfish announced today their 2017 season-long campaign to promote the first transcontinental Total Eclipse in 99 years and the once of a lifetime view from Lexington County, S.C. for the August event. On August 21st at 2:41 pm the “Centerline” of the path of totality of the eclipse will cut through the heart of Lexington County and cast total darkness for 2 minutes and 38 seconds. Being on the “Centerline” is most important for viewing the longest totality. The “Centerline” will make Lexington County the prime spot to see the transcontinental total eclipse as it delves West to East from Oregon directly through South Carolina and almost precisely the spot of Lexington County Baseball Stadium. In commemoration of the “Centerline” going directly through Lexington County, the Lexington County Blowfish have designed one of a kind Total Eclipse themed jerseys and will wear them during the 2017 season including Opening Night, Wednesday, June 1st at Lexington County Baseball Stadium and selected other fun packed games. Columbia and the Midlands, and by sheer science, Lexington County is going to be an awesome view of the total eclipse. The Blowfish want to help spread the word on this amazing opportunity to observe from the optimal viewing point. To help draw more attention to Lexington County and the “Centerline” the Blowfish will also wear the themed “Total Eclipse” jerseys during selected road games to the fifteen cities of the Coastal Plain League, which include other South Carolina cities and in the states of Virginia, North Carolina and Georgia. “I am a bit of an astronomy enthusiast and my wife Vicki and I hold Lexington County close to our heart. We are proud to live in Lexington County and to have the Lexington County Blowfish show support for science and the five Lexington County Elementary School Districts. 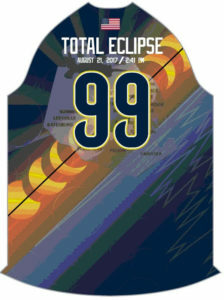 The one of a kind commemorative total eclipse jerseys will be helping to raise funds and awareness for science programs within all the districts,” said Bill Shanahan founder and co-owner of the Blowfish. You can actually bid on your own total eclipse themed player jersey by submitting a winning bid during a silent auction held on the final Saturday night home game of the season, Saturday August 5th. Fans will have an opportunity to bid on the player jerseys that night up to the seventh inning. The auction will be followed by a “Total Eclipse” Concert in the Sky Fireworks Spectacular. Proceeds of the auction will benefit the five Lexington County Elementary School Districts to help promote science. The Lexington County Blowfish in cooperation with the Lexington County Recreation & Aging Commission will open the Lexington County Baseball Stadium and field as a free, safe and central location to view the Great American Eclipse. Other season long promotions include during each home game a “Total Eclipse Inning” winning Total Eclipse Glasses and “Moon Pies” will be tossed out to the crowd. In additiion, the foul lines at Lexington County Baseball Stadium will be renamed for the 2017 season as “centerlines”. • This is the first transcontinental total eclipse in nearly a century and will begin in Oregon and end through South Carolina. • The Moon completely covers the disc of the Sun. Only the Sun’s corona is visible. • The sky goes dark, temperatures fall drastically- birds and animals often go quiet. • The Centerline view will enable you to see diamond rings and the interval of totality between them. • The shadow is round so the longest eclipse occurs at its centerline where you are at the Moon’s shadow’s full width. • August is a perfect time of year for camping, so consider bringing a tent or RV and experience the centerline of the total eclipse at Lake Murray. • The Midlands and Columbia will be a host to a variety of events the weekend of August 18-21as part of the total eclipse observation. If you plan on viewing the eclipse, you’ll need to take precautions to protect your vision. The only safe way to look directly at the uneclipsed or partially eclipsed sun is through special-purpose solar filters, such as “eclipse glasses”. The Lexington County Blowfish are a proud member of the Coastal Plain League. The Boys of Summer play their home games at Lexington County Baseball Stadium. Players are recruited from colleges and universities from across the region and nation including the USC Gamecocks, Clemson Tigers, Coastal Carolina along with other SEC and ACC schools. The Blowfish begin their 11th season and third in 2017. The Blowfish would like to thank our friends at Carolina Comfort Heating and Air for their support of the Total Eclipse campaign.